Walking stick bugs and praying mantises are unique insects; it requires a sharp eye to find either one crawling along a tree branch or hiding in a pile of leaves. Although these insects share some characteristics, such as camouflage for passive defense, they differ in features such as habitat, diet and captive care. Walking stick bugs have life spans of up to 3 years in the wild. They grow no more than 13 inches long. 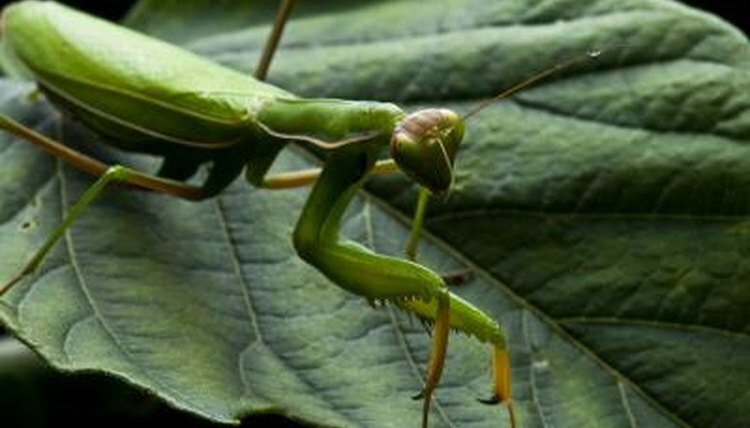 Praying mantises typically live no longer than 1 year. They grow up to 6 inches long. Praying mantises are excellent garden predators with exceedingly quick reflexes for stalking and catching prey. Walking stick bugs are found in every continent except for Antarctica. They prefer living in tropical climates near the equator, although they also prosper in grasslands and forests north and south of the equator. Praying mantises are also distributed across the globe but not in Antarctica. They, too, prefer to live near the equator but are found living in forests and meadows. These insects spend most of their time camouflaging themselves among plant life. Walking stick bugs are herbivores and eat different species of fresh plant leaves, from bramble to oak leaves. Different species of walking stick bugs prefer different species of plants, generally several types of plants they prefer to eat. Praying mantises are carnivores who eat a variety of insects, such as flies, grasshoppers, crickets, moths and even other praying mantises. Female praying mantises are known to eat their mates during or immediately after mating. Your walking stick bug needs an enclosure whose height is at least 3 times longer than his body length and whose width is at least 2 times longer than his body length. Cover the floor with a substance such as potting soil or pebbles that absorb moisture. A walking stick needs a mesh or net roof to grip while the creature sheds. Walking stick bugs require fresh leaves to eat daily, which also serve as decoration. Clean his enclosure often to remove droppings. Your praying mantis' enclosure should have sticks for climbing around on. Place small rocks, pieces of bark, shredded wood or sand at the bottom of his enclosure to absorb moisture. Spray water into his habitat as needed to maintain humidity levels. Feed your praying mantis every two to four days. Drop in crickets, bluebottle flies or Dubia cockroaches and watch your praying mantis capture and eat his prey. Remove any prey that is not eaten to keep the enclosure fresh.